If you are looking for a unique vacation destination, consider Cumberland Islands off the coast of Georgia. It is known for its many unique marshland animals as well as its part in the history of the American Revolutionary War. Different people look for different things in a vacation, but the opportunity to travel somewhere fascinating or enjoyable that is a little off the beaten path and largely without the overcrowding experienced in large cities is usually welcomed by many. The state of Georgia is a great vacation destination with wonderful historic sites scattered about its entire area. The state also offers first class dining, shopping, and tourist attractions in its largest city and capital, Atlanta. One of Georgia's best kept secrets though sits just off its shore, Cumberland Island. Georgia has many barrier islands that sit off its Atlantic Ocean coastline, but Cumberland Island is the largest. With seventeen miles of largely unobstructed beaches, the opportunity to explore the coastline and view Atlantic Coast marine life and the natural environment is one of the main attractions to the island. Inland from the beach area, visitors will find large tracts of old growth oak trees and on the island's western coast they will see marshy areas that attract many different species of birds, and the birdwatchers that love them. A number of different wildlife viewing opportunities present themselves on the island with the most common sightings being that of armadillos, wild pigs, raccoon, squirrels, and deer. Alligators have also been reported on the island but are seldom seen by visitors to the area. Cumberland Island has had an interesting and varied history. During different times of the past it has served as the home for Native Americans, the site of a Spanish Mission, a private hunting ground, exclusive homes for some of the nation's elite, and finally a National Seashore. One of the most famous early residents of the island was Nathaniel Greene, a hero of the American Revolutionary War, who came to island to harvest oak for the purpose of ship building. 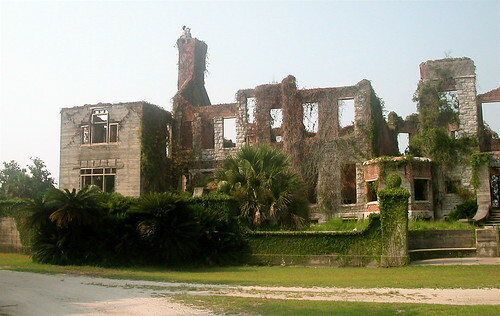 The famous Carnegie family moved to the island in the late 1800s, and over time would accumulate ownership in upwards of 90% of Cumberland Island. The majority of the land on the island came to be owned by the National Park Service through donation from the heirs of the Carnegie family. The island measures in at almost eighteen miles long and while it is a popular vacation destination, there are no bridges connecting it to the mainland and no airfields on the island, meaning all visitors must get to the island either by private boat or on board the Cumberland Ferry. There are a number of different types of accommodations available on the island including hotels, bed & breakfasts, rental properties, and campsites. With the National Park Service limiting the total number of people on the island at one time to just 300, there are plenty of opportunities for travelers going to Cumberland Island to experience a quiet and remote place all to themselves. Visit Georgia and Cumberland Island on Expedia. Utitlize an expedia coupon code for added savings. A visit to Cumberland Island is perfect for anyone looking to get away from the hustle and bustle of more urban areas. The island offers plenty of activities to pursue and sights to see, and does so all while limiting the total amount of tourists that can visit it each day. There are no paved roads or paths on the island and it can be a literal step backward in time, but it also can be the type of experience that makes memories that will never be forgotten. Cumberland Island is a truly special location that offers experiences other places just cannot match.